Are you spending Christmas in Iceland? You should learn about Iceland's Christmas traditions. First of all, "Merry Christmas and a happy New Year" in Icelandic means "Gleðileg jól og farsælt komandi ár!" When planning a vacation during Christmas in Iceland, it is always helpful for visitors and travelers to get acquainted with local Icelandic Christmas traditions and different customs. You can even send Santa mail by using his very own mailbox. Christmas in Iceland is an interesting experience as this country has many old traditions for celebrating Christmas. Expect no fewer than 13 Icelandic Santa Clauses. In Iceland, they are called jólasveinar ("yuletide lads"; singular: jólasveinn). Their parents are Grýla, a mean old woman who drags off naughty children and supposedly boils them alive, and her husband Leppalúði, who is not quite as mean. Iceland even has a black Christmas cat that is depicted as an evil cat on the prowl for anybody who is not wearing a piece of newly purchased clothing. The origin of the Icelandic Santas is centuries old, and each has its own name, character, and role. Over the years, these 13 yule lads have become nicer. In fact, in the 18th century, parents in Iceland were officially prohibited from tormenting children with scary stories about the yule lads. Nowadays during Christmas in Iceland, their function is to come to town bearing gifts and candy (and a prank or two). The first jólasveinn arrives 13 days before Christmas and then the others follow, one each day. After Christmas, they leave one by one. The Icelandic Christmas season lasts 26 days. Thorláksmessa (mass-day of St Þorlákur) is celebrated on December 23. Shops are open late and then close for three days during Christmas. Many attend midnight mass. The main Christmas celebration takes place on Christmas Eve, including the gift exchange. A special Icelandic custom for children is to put a shoe in the window from December 12 until Christmas Eve. If they have been good, one of the 13 yule lads leaves a gift—bad children receive a potato or a note from one of the yule lads, explaining an incident of naughty behavior or warning them to do better the next year. When it comes to weather, don't expect much daylight during Christmas in Iceland, as this is the season where the Nordic countries stay dark through most of each day. The further north you go, the less light you can expect. It does make for much better shows of Northern Lights and fireworks, though. On New Year's Eve, many people attend community bonfires and exchange visits. At midnight there is a spectacle of fireworks when almost every home in Iceland will light its own fireworks. 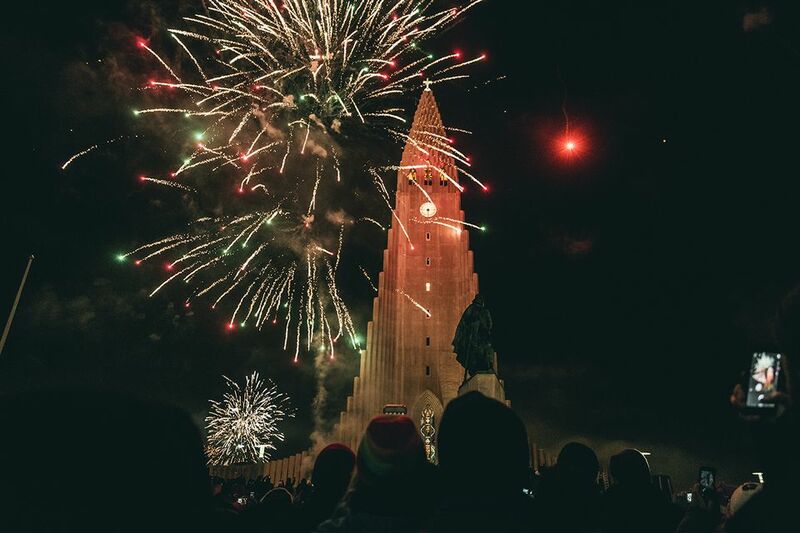 Iceland's holiday season ends on January 6 with a special celebration of the Twelfth Night. This is when elves and trolls come out and celebrate with the Icelanders, dancing and singing. On this day, the festivities of New Year's Eve (bonfires and firework show) are repeated in smaller extend all across Iceland.